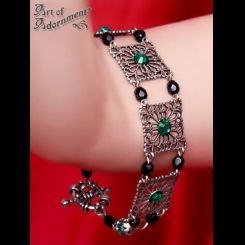 Glass bead expansion bracelets, Gothic charm bracelets, stretchy black lace ruffles and antiqued silver Victorian filigree links with crystal rhinestones. Hand made in Canada. Bracelets can be resized upon request (inquire before purchase).